You might recognize her name as the co-founder and former publisher of the Chronicle, or recognize her face as a volunteer for a number of clubs and organizations. That’s because Jane Gilman has been a fixture on Larchmont for more than five decades. Her love for Larchmont first began in 1963, the year that she joined Dawne Goodwin to publish a 12-page newspaper. “I had met Dawne at a previous job, a newspaper delivered to the aerospace industry. She was selling ads, and I was writing articles,” said Gilman last month while sipping a coffee on Larchmont Boulevard. According to Gilman, the two women were out of jobs. “So I said to her, ‘why don’t we start our own newspaper’ and suggested we do something focused on shopping centers. “’Oh,’ Dawne said. ‘I know a nice shopping area.’ So she took me to Larchmont Village, and it was just like my hometown of Rye, N.Y., where I grew up reading the ‘Rye Chronicle,’” says Gilman. The two intrepid entrepreneurs hit the sidewalks of Larchmont to talk to business owners about advertising in a new community newspaper. “One of the reasons for our success was because you couldn’t say ‘no’ to Dawne,” explains Gilman, who notes that the paper’s first advertising director, who passed away in 2012, was an attractive woman with blue eyes and a strong sales pitch. After approaching a few storefronts, the two ladies got their first big break: the Larch-Mart Grocery (then at 227 N. Larchmont and today the boarded-up Mizrahi building north of Vernetti) agreed to take out full page ads on the back cover. California was threatening to build a freeway through the neighborhood. The job was never boring, and Gilman says that she felt good about the work she was doing because it promoted and highlighted so many important local issues. “Sometimes I had to pinch myself to see if all of this was really happening,” she gushed. Gilman was acutely aware of the responsibilities that come with being the voice of a community. “We started the Larchmont Family Fair as a way for local churches and schools to make money, as well as it being a wonderful event for kids,” she says of the popular fall event. And that’s just one example. Gilman also was responsible for reinvigorating the Larchmont Boulevard Association, which had been dormant for many years. When the homelessness situation seemed to get worse, she joined with charity Hope-Net to create the Taste of Larchmont as a way to raise attention and resources for those in need. 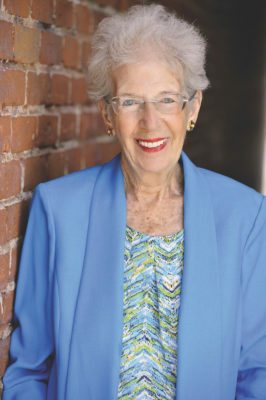 She helped to establish the Windsor Square Hancock Park Historical Society in 1976, and in 1996 she joined with Steve Kramer to activate the Miracle Mile Chamber of Commerce. Due to word-count limitations, it’s impossible to mention everything in the community that Gilman has either directly, or indirectly, been involved with over the years. Even today, while technically retired, she spends her time organizing community and charity events. Currently, Gilman serves as the public relations chair on the board of The Ebell of Los Angeles, and she serves as a tour co-chair for the Windsor Square Hancock Park Historical Society. In her spare time, she is working on a book — “a non-fiction account of the neighborhood and its founders, the Hancocks” — and she keeps a monthly tee-time with this reporter, who can attest to her impressive golf swing. Reflecting on her long career and public service in and around Larchmont, Gilman says credit also goes to many “unsung heroes who have done so much behind the scenes to improve the community.” That includes her husband of 59 years, Irwin, who always has been there to help. For Gilman, her love for Larchmont has been a long affair that continues today.